2. In a small bowl, blend butter with diced pickles, tarragon and mustard; season with salt and pepper. 3. Rub salmon w/ oil and season with salt and pepper. Grill over moderately high heat, skin-side-down, until the skin is lightly charred and crisp, about 3 minutes. Using a metal spatula, turn the fillets and grill until barely done in the center, about 4 minutes longer. Transfer the salmon to plates. 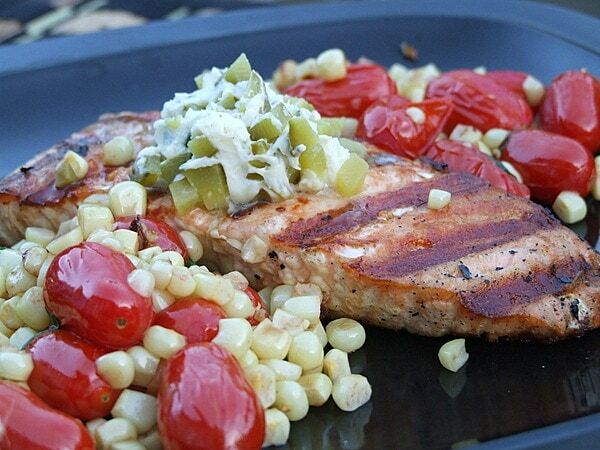 Top with dill pickle butter and serve. *If you are preparing this as a gluten-free dish, just be sure to use a brand of Dijon mustard that is known to be GF. 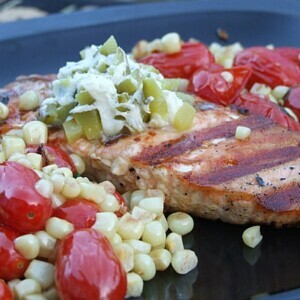 *Serve with sauteed fresh corn and cherry tomatoes.